Writing a memoir centered on a theme can offer readers a sort of trail map through the author’s life. Richard Zakka uses a metaphor to do just that in A Snowflake Never Falls in the Wrong Place. The book begins by tracing Zakka’s upbringing from Lebanon to the Port of Aden to Texas, where his family moved in 1964. He studied to become a civil engineer while his family ran a store, but after graduation, dreams of fame drove him to pursue an acting career in New York. A successful actor and screenwriter, he honored his father’s wish that he have a stable fallback by running several side businesses. (Readers will gawk at his account of renting a 2,500 square foot loft in New York City for $300 a month, a space he continually remodeled and upgraded with income from his various endeavors.) Zakka currently lives in Florida with his wife and is involved with a mineral water business. 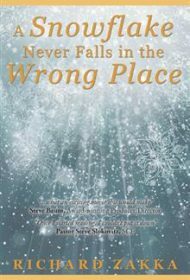 While the snowflakes seem to be a metaphor for God’s plan, the author doesn’t overtly make the connection, and as the “snowflakes” pile up, they become distracting. The book’s end ties these coincidences to the number 13 and the letter “M,” which further confuses the message. Occasional misspellings and misused words (e.g. “illegible” for “eligible”) also prove diverting. A Snowflake Never Falls in the Wrong Place doesn’t need its central metaphor to succeed; the author’s life is sufficiently full of stories to hold reader interest without it. While removing the snowflake metaphor would improve the book, readers will nonetheless find much to appreciate here.